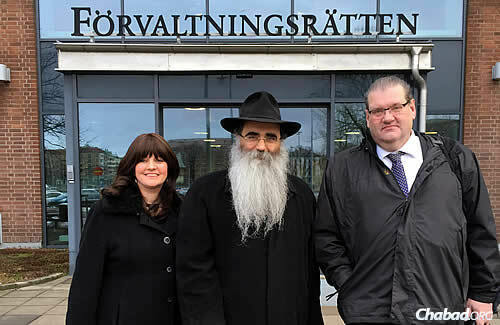 Rabbi Alexander and Leah Namdar, co-directors of Chabad-Lubavitch of Sweden, with their lawyer, Ulf Tollhage of the Nordia Law Firm. The couple has been involved in an ongoing legal battle for the right to homeschool their four youngest children. Moscow - One of Chabad movement’s top rabbis accused Sweden of “persecution” against a Hasidic couple who sought to home-school their children in Gothenburg. Rabbi Lazar are u done with Russia? How about Russia throwing out few of ur fellow Chabad rabbis the last few months. Is that ok? having said that , Rabbi Lazar is adressing his serious concern , to a difficult problem , as Sweden is harboring very anti-Semitic feelings, and just picking on a Rabbi , for home schooling, , as you can see from the fine ,and the fact that it has reached Supreme Court to rule . I'm saying it as it is. And u didn't answer my question!